The modern bathroom has become a prestige fantasy for many homeowners. From tubs designed to make room for any decadence that appeals to you, to sleek bath vanity cabinets that bring back memories of spas or evoke odd images of lavatories woven through magical bamboo groves, everything is beautiful. Even modest little bathrooms are currently prime space for renovation and home improvement projects. If you are hoping to do an improvement on your existing bathroom you are in luck. Because of the luxury trend the do-it-yourself handyman has access to a world of supplies and bath vanity cabinets he or she would previously have had to make from scratch or just do without. The primary issues facing the home-improvement fan are the limits facing all designers: space, function, materials and finances. In a small bathroom space is the single most commanding challenge. In these cases true bath vanity cabinets are often giving way to pedestal sinks, raised shelves and medicine cabinets, and storage in outer hallways. In very tiny bathrooms cabinetry can seem to take over space. If for some reason you must have vanity cabinets in a very small room, choose the simplest you can. and if you wish try to restrict yourself to prefab cabinets. The advantages of prefab are numerous. Most prefab is built to a high professional standard, and unless you are a pro-level cabinet maker you are probably more capable of a superb installation than a superb creation from scratch. Pre-fab bath cabinets are made to fit common bathroom hardware, are made to resist moisture, to be easy to clean, and to fit efficiently into the most common bathroom dimensions. When buying a previously made bath cabinet you are choosing a professional product designed to offer professional designers a wide range of style and details that will live up to their customers standards. 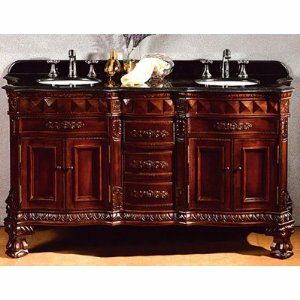 Most professionally designed and produced bath vanity cabinets are simple to install. A home-based craftsman can expect to remove an old cabinet and replace it with a new one in an afternoon. Even with challenges such as removing the sink and fittings a cabinet is made to slip right into available space, avoiding all plumbing in most cases. A bath vanity case eases into the area forced by the plumbing. Minor caulking and application of sealant may be needed where the cabinet butts up against the wall, or around the edges of the sink and fixtures when they are set in place, but the actual placement of the cabinet requires few tools, and only moderate patience and strategic thinking. Return From The Bath Vanity Cabinets Page to Home - Finishcarpentryhelp.com.